Vegan 'death threats': show them, report them, or shut up! Vegan ‘death threats’: show them, report them, or shut up! 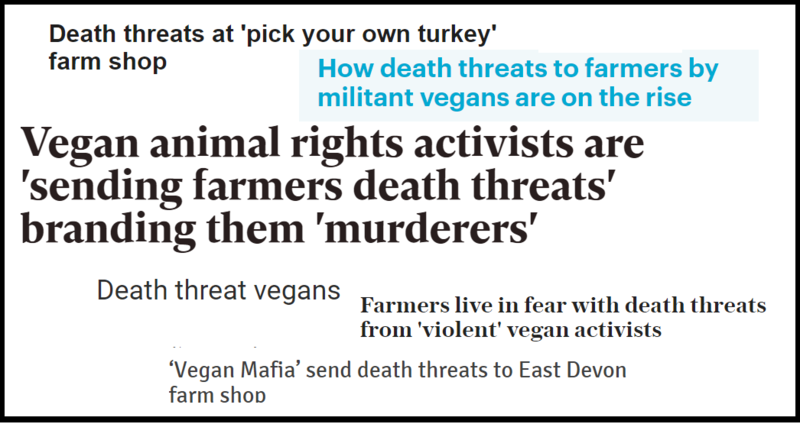 It seems like hardly a week goes by without sensational headlines about ‘vegan death threats’ appearing all over the mainstream press. The narratives follow a standard pattern. A business profiting from animal exploitation, usually in a particularly outrageous or shameless manner, will be called out by vegans and exposed to others via social media. Critical comments will then be left on the animal exploiters’ social media pages, they’ll be left bad reviews, sent private messages and emails, and may even receive a few telephone calls by those who want to express their objection to the business’s activities. The business owner will then allege that they’ve received death threats from vegans, which the mainstream media reports as fact. Vegan death threats provide the mainstream media with a clickbait-y headline and a compelling story. Look at these hypocritical vegans threatening decent hard working folk! They’re supposed to be compassionate and preach non-violence towards animals but they want to kill other humans! It’s a narrative that plays very well with the kind of tabloid reader who’s hostile to the idea of veganism, finds vegans annoying, and who’d prefer them all just to shut up and go away so they can eat their bacon sandwich in peace. The problem with this narrative, of course, is that no actual evidence of the alleged vegan death threats is ever shown. Claims are made, repeated, and accepted as fact without the presentation of a single screenshot, quote, or crime reference number. I first wrote about the problem of such allegations back in early 2016, in an article which showed how The Kings Arms in Fleggburgh, Norfolk – a pub which received attention for having foie gras on its Valentine’s menu – was highly likely to have lied about receiving death threats. Alleged death threats to The Kings Arms reported by the BBC. The Kings Arms presented no evidence whatsoever of the approximately 200 death threats the owner said they’d received; there were no screenshots, no direct quotes, no phone call recordings, and their allegations were also contradictory in nature. The main evidence casting serious doubt on their allegations however was provided by Norfolk police, who declined to investigate further and explicitly stated that “no direct threats had been made” to the pub! By that point though the damage had already been done, with the allegations widely repeated in the mainstream media and accepted as fact by many members of an unquestioning and in some cases actively vegan-hostile public. The vegan death threat narrative climaxed in February this year, when animal farmer Alison Waugh claimed in a BBC video that she’d received death threats from vegans because of her occupation – claims again repeated without question by various other publications. Alison Waugh’s death threat allegations on the BBC. Even The Vegan Society ran with the story and used Waugh’s claims as the basis for an article condemning vegans who make death threats, before bowing to pressure from disgusted vegans and amending the article to make it clear that the claims were allegations and that vegans are frequently on the receiving end of verbal and physical abuse. An analogical, rhetorical question on the other hand, which places the abuser in the position of the abused animal to try and invoke empathy for the animal, is not a death threat. Such a question might be, “How would you like to be skinned alive?”. Whilst an analogy such as this may be shocking to some it quite obviously isn’t a threat, let alone a death threat. I strongly suspect that the vast majority of supposed ‘vegan death threats’ are simply a case of business owners presenting rhetorical questions, asked to highlight the horrors committed against animals and to try and spark empathy with them, as death threats. Whether that’s by mistake or intention is difficult to say, but it would certainly be in a business’s interests to deliberately misrepresent vegans in such a way. The ensuing mainstream media coverage of ‘death threats’ from implicitly unhinged, potentially dangerous vegans creates sympathy for the business owner and their staff, generates a lot of free publicity for the business, and demonises and undermines one of the key threats to their business and profits – vegans and the spread of vegan ethics. How do we respond to death threat allegations? Deliberate misrepresentation or otherwise, the effect of vegan death threat claims is the same – negative publicity for vegans and veganism. That’s why such allegations need to be quickly, directly and firmly challenged. Whenever we hear of a business owner who’s received death threats from vegans, ask the person making the allegations to either present their evidence or take it to the police to be investigated. State that the police take online threats very seriously and that there have been a number of criminal convictions of those who have threatened to kill others via the internet. If death threats have genuinely been made, the person making the allegations should be quite happy to do this. We shouldn’t think that we have to soften our language and tone when communicating with animal exploiters. Moderating our language, by avoiding the use of such devices as rhetorical questioning, would simply be self-defeating appeasement and would concede power to the exploiters. Remember that some animal exploiters will try to spin any vegan action or communication in a negative light; if we censor ourselves and moderate our non-violent advocacy through a fear of being accused of aggression, then we will simply be dancing to the exploiters’ tune and weakening our own position. Have vegans never issued threats and is every single one of the ‘death threat’ allegations false? Let’s be honest here – it’s unlikely. Vegans are justifiably very, very angry and in the face of such horrific treatment of animals it’s possible that in the heat of the moment threats to property, or even life, have been made. But the number of times this has happened is likely to be very small, and certainly not representative of the behaviour of the vast majority of vegans. The problem of online abuse is not specific to vegans anyway. Lots of different kinds of people spew abuse and issue threats online, to lots of different kinds of people. Vegans themselves are on the receiving end of abuse and threats daily. Instead of absurdly scapegoating vegans, society needs to address why some people feel that issuing a death threat is a positive way of dealing with a problem – and why they’re unable to pursue some other, more productive course of action to try and resolve a grievance. A final point to remember is that it would be very easy for animal exploiting businesses – or their sympathisers, or trolls – to make false death threats to try and inflame the situation and/or frame vegans. A throwaway email or social media account takes minutes to set up, and if a malicious individual wanted to cover their tracks it would be quite easy for them to send anonymous threatening messages with the help of easily downloadable software. In summary, and to provide the kind of clickbait headline that the tabloid press loves to smear vegans with: show us the vegan ‘death threats’, report them, or shut up!